HP developed fewer thermal printers than printers of any other technology. And they had pretty much run their course by the early 1980s. Nonetheless, thermal printers provided a major advantage over the impact printers - they were quiet (although the paper advance mechanisms could be clanky, as evidenced by the 2671 printers). Thermal printers produced images on pages by heating special thermal paper to "discolor" it (usually either a black or a blue color). But the special paper had many disadvantages. It was expensive. It was cumbersome to handle; printouts usually had to be cut to size with scissors after printing. And, thermal paper faded over time. 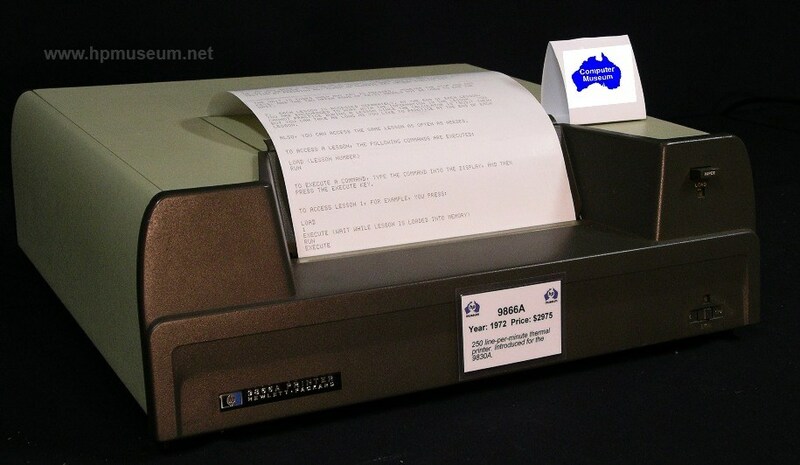 Often, thermal printer output was photocopied to get the image onto a more comfortable paper and to prevent eventual fading. The output of some of HP's classic early computers went mostly to thermal printers. These included the 9830, 9825 and 9845. HP had a tendency to market a separate type of paper for each of its thermal printers (encompassing many different part numbers). Modern thermal fax paper will work in almost all (if not all) HP thermal printers. Be sure to visit our Supplies and Consumables Catalogs for part numbers and information on all the media and accessories available for these products.